To savour the day and follow the promptings of one’s heart: this bold deed means “to lead,” particularly by example. Discussions of leadership rarely take into account the emotional ramifications of this virtue. Too frequently it is deemed a cerebral activity, a formidable intellect that knows when to sound the call or when not to call at all. Leadership, however, is largely an instinctive act and it is not spoken: it is done. The history of mankind is replete with the quiet passion of people who have, unbeknownst to historians, led the way through the heart. I knew an elderly man who spent less time with his “normal” children and more time with his firstborn son, a child affected, but not defeated, by autism and other developmental problems. Some of his “normal” children were jealous, even after their sibling peacefully left this life. This man, this father - was a hero. I wrote a letter to him one summer affirming his quiet heroism which day-by-day, week-by-week, month-by-month was ignored, disregarded, even criticized. He kept that letter until the day he died. I do not know what happened to that letter after this gentle man no longer drew breath upon this earth. His heroism was the source of angst among the individuals who were supposed to love him. I am thankful that my words gave him solace amongst that angst. I am comforted by the certainty that my courage counted when it was most needed. Nowadays, it is becoming increasingly heroic to speak the truth, to dare to become all that you can be, to stand up for beliefs that are timeless and cherished, to treasure freedom (which is not free). Freedom is given away silently every day and people do not realize it. The barbarians of the world subsequently take advantage of the softening up that a free society has already agreed to. And we then must all work like there’s no tomorrow so that we will have a tomorrow. Life is too short and too precious for anyone to worry about things that are not real. The things that are real are the things of the heart – the mind sometimes can’t keep track. The matters of the heart are often not heard and even more frequently not understood because of the noise of the rabble-rousers of life who prefer that we not see their cowardice, their blindness, their contempt for life itself. Facts – not fears – are needed during times of great uncertainty. And we live in a time of great uncertainty. The 1930s were a time of great uncertainty. Charles de Gaulle certainly thought so. In 1932, he wrote his little treatise on war and leadership, a literary smoke bomb entitled Le fil de l’épée (The Edge of the Sword). 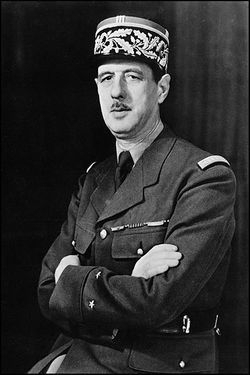 At the time, de Gaulle was a Lieutenant Colonel in the French Army. He was going nowhere, fast and slowly. He saw that the French Army was also going, not nowhere, but in the entirely wrong direction and fast. 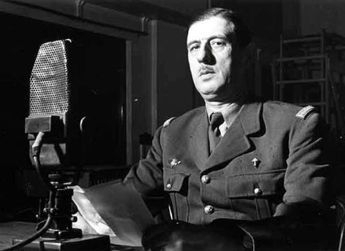 De Gaulle would become a leader and a hero in 1940, but in 1932, and during those somnambulant years between the wars, entre les guerres, he was a man with an unpopular mission and a man with a very sharp tongue. At times, the tongue was vituperative. His words were steeped in melodrama, the melodrama of truth. Uncertainty marks our time. So many denials of our conditions, prophecies, doctrines, so many trials, losses, deceptions, so many sudden uproars, also, shocks, surprises have shaken the established order. Weapons, which have just changed the world, do not leave us to first suffer from them and cry their lost fervor. After having submitted to the cruelties of force, the masses react with passion. A sort of mystique is spread everywhere which, not only tends to speak ill of war, but inclines toward limited thinking, as much as one would want it. Fervor is not without exorcisms: to conjure the bad genie, a great tumult of public denunciations resounds across the world; to suggest the horror of the sin, a thousand pictures are applied to represent its ravages by hiding what is effective and grand there. Of the battles, one wishes to evoke only the tears, the fallen, no longer the glory with which the peoples console their sorrows. 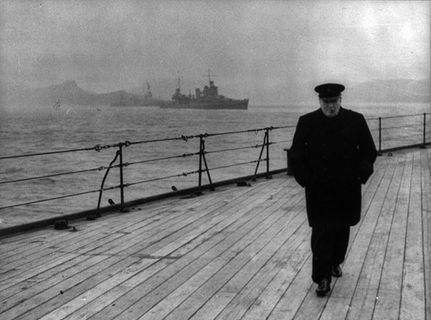 It is no longer according to History, of which some people distort the features, under the pretext of erasing the war. Military order is attacked in its root. All the more since such a movement, however excessive it appears, is understood only too well. That way is manifested, in sum, the instinct for preservation of the weakened Europe and which perceives all the risks of a new conflict. The spectacle of an invalid who stretches the fist out toward death cannot leave a person unfeeling. Moreover, how to establish this international order, to which aspire, for the time being, the calmed peoples without the help of a vast collective emotion? Now, one does not move the masses other than by elementary feelings, by violent images, brutal invocations. Without strength, in effect, can we conceive life? That birth is hindered, that spirits are sterilized, that souls are frozen, that hunger is lulled to sleep, then, without doubt, strength will vanish from a motionless world. Otherwise, nothing will be made that remains essential. Refuge from thought, instrument of action, condition of movement, this midwife is needed to pull the day into progress. Shield the rulers, rampart the thrones, battering-ram the revolutions, order and liberty, must, in turn, be given. Cradle the towns, scepter the empires, ditch decadence. Strength lays down the law to the peoples and orders them their fate . . . In Great Britain, Winston Churchill was even more eloquently sounding a very similar call to the masses of his beloved nation. Few listened. Among the few who listened, none openly agreed. Delusions came in the form of appeasement back then. Presently, delusions come in many shapes and forms. The only climate change worth seriously contemplating is when the Climate of Cowardice changes into the Climate of Courage! Mankind is assuredly in charge of that change. I recall the historically frigid winter of 1978-79, the last year that I resided in the eastern portion of the United States. Back then, the huge and loud prediction of that fomented fear mania was Global Freezing. Winning the Cold War had to fight for freezer space! Once an illusion is destroyed, reality rushes in. Initially, it’s a rush of horror, wrapped in fear. Everything that the illusion sugar-coated and concealed — those things come to the fore. It’s not a pretty sight. And so the shrewd but craven politician does everything he can to keep those rose-colored glasses on the eyes of the populace, The true leader looks reality straight in the eye and takes the risk of calling “it” like “it” is. He takes the risk of rejection by the public; it does not always work out for him. It might, however, work out for the public, even for the nation, hopefully for the world. I have a theory that there are times when technology and commerce lead the way in the world; the feckless politicians feed off of that trough of inventive money and innovative energy. Their palms get mighty slippery being greased with the profits of inventive companies breaking new ground. It turns out, however, that this ground has been broken and manured before, in fact, many times before. The Titans of Industry are now the Young Turks of Technology. After their financial tête-à-tête and partnering (ah! I remember when the verb meant, to dance), the nouveau-age corporate cronies and cowardly politicians then publicly decry corruption. Maybe the sweetheart deal was not sweet enough. It definitely lacked heart. A mutually parasitic symbiosis does not require heart or soul or even much mind (thinking). That symbiosis exists, for a while. The mutually parasitic symbiosis is a far cry from the mutually beneficial (and beneficent) symbiosis that demands heart and soul and mind. It lives, sometimes forever. If this give-and-give harmony is already in place when disaster strikes, the best of each person is brought out. If that fusion has not been nurtured (and oftentimes it has been deviously exploited), then a disaster will only exacerbate what has already been divisive – selfishness, resentment, envy, greed, even hatred. The sins of the sinister live on, that is, until people of courage take a stand to stop the stinking stain from spreading any further. One bold step can put into motion many footsteps of heroism, the quiet heroism that echoes forth down the generations as the best, shining hope of mankind and of womankind alike. Disasters can unite people who refuse to be divided. Disasters are the pathways for true leaders to emerge from amongst the heavy throng of disheartened people. Disasters are not the gig of the parasitic politicians, the poseurs of contemporary times. They find disasters, like the deaths that accompany them, most inconvenient, even a bit tawdry for their own tasteless tastes. For a time, these poseurs blame the disasters, and the attendant deaths, on someone -- or something -- else. But disasters have a way of piling up. The disasters mount up to a point where a leader, a true Leader is forced, by fate and by forces within his conscience, to emerge while the frauds of the world stammer into a stuttering tizzy, overwhelmed by the waves of History. None too soon are they jettisoned from the ships of state they have nearly run aground through their own arrogance and lassitude. Those nincompoops are then mostly forgotten. It’s a double-edged sword, the forgetting. 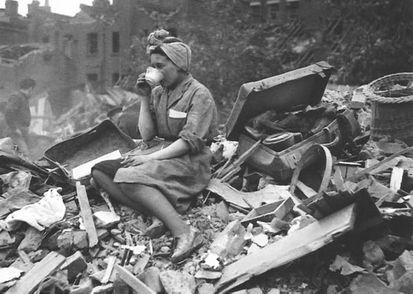 People ought to remember such failure and ruinous chaos but they want to look ahead, not back. The other edge of the sword - being forgotten - is a deserving fate for the frauds who sought fame and fortune and immortality more than mere honesty, honour, dignity, and can-do. In the end, which becomes their end, they can’t do, and they never could. Their legacy is a profane immortality akin to the fate of the dead in the darkness of the ancient Greek underworld where, for ever, the vile creatures eat dust. Perhaps, in America, there is a horrid hagiographic biopic made of them, but largely the frauds are forgotten. The peoples of the world just have to survive the wreckage caused by the pompous phonies who were blindly put in charge of business - until the business of History forces the frauds off of the stage of life and down from the grandstand of History. “Out, out, brief candle” can never be too brief. The Leader rises to the occasion. He does not run away from it; or send his minions to the microphone to belittle it, mock it, and obfuscate it with a sham Boogey-man. The bogus leader, unaware that he is telling even more about his cowardice, pretends the occasion does not even exist. The Leader has a commitment to lead because first and foremost, he has a conscience. And that conscience is what guides him and leads him, straight as an arrow, to sharpen his skills and hone his talents until he is the edge of the sword. For the Leader, the desire, even compulsion to lead is purely instinctive. Such a person disregards the logic of leverage, the reasoned statements, the cost-benefit ratio, the notion that he will look crazy or bizarre or just plain weird, and the fear that he will fail. Failure is not an option for the leader, although he knows that he may not win on the first try. Chances are he will not at first succeed. He may stumble and he might fall. But he picks himself up, again, and, if need be, again and again and again. He knows that the lives of too many people depend on him. He rises not for himself but for everyone else. He rises because he knows that not to rise, to stay below his fate is to be a coward. He rises because God has given him this duty and he must do his duty, come what may. Leadership is instinctive, intuitive, and sometimes instantaneous. It is also a solitary act, or series of acts, although it is never lonely. The leader feels at one with the higher purpose, the greater good, and the voice of God. If 50 million people believe in a foolish thing, it is still a foolish thing. A foolish person is not merely someone that believes in the foolish thing; he believes in the foolish thing because 49,999,999 other fools also believe in it. The fortunate person is he who has something real to believe in; and he believes it not because of what others believe but because he, and he alone, has chosen to place credence into this idea, this thought, this vision that is almost pre-verbal in its cogent state within his consciousness. What others think of the fortunate person does not matter; it is what he thinks of himself that is of supreme importance. That fortunate person is destined to become a Leader. While everyone else, perhaps all of the world, is enthralled to be chasing after rainbows, visions that are, in reality, manufactured spectrums of light, the Leader sees only the Vision in his mind. It is a vision born of wonderment and wisdom, a view that is uniquely his, but it is a view that he definitively chooses to share with the world, with those 50 million believers in the foolish thing. Why does he decide to make public such a private, personal, even intimate vision? An inner voice, which may be the voice of God, or the voice of madness, tells him that it must be done. The Vision does not belong to him. It is part of the truth, and the truth must be spoken or the truth will die, first within him, and then bit-by-bit beyond him. And the leader cannot bear to watch the truth die, inside or outside of his world. He waits until the time has come to speak, to have his say, to lead. With some level of amazement, the Leader realizes that through imparting his Vision to the world he is guiding others toward the truth. The unexpected and unrequested reward is rich: no longer is he alone in the world. No longer is he a solitary figure. No longer does he walk the earth in anonymity, without a face, without a name. Out of the sheer need to survive, a duty that must encompass the art of love, he leads because not even he can love a nameless being. And he was this nameless being, existing in the shadows of the dark. Fate has brought him into the Light. He now is The Leader. Through the power of his own benevolent belief he bridges the gap that has separated him from others. His individual force of will for good becomes a catalyst for the collective force of will for good. Nothing on earth can stop this force for it functions as an instrument of the Celestial Conductor. This medium is not unlike spiritual music: a violin says in divine terms what the humble heart and gracious soul feel. Leadership thus consummates a gift from the heart. The leader is connected through a continuum of empathy to all of those other people, perhaps even the 50 millions who no longer believe in the foolish thing, but they but have not yet discovered the vessel of truth into which they can securely place their by-now neglected if not abused faith. And those 50 millions are gently and graciously touched by the Leader. Lives can be changed through such miracles of faith. If the leader is a star, a good star, then you are the faithful mariner who relies on it. A star without a purpose does not shine. To lead is to take that first intrepid step that so many others will not take. To wallow in indecision is to allow a blanket of fear to smother one’s instincts, to drown out the mystical, magical, but very vital and very real clarion call that directs one, and then all, to the future, to destiny. Indecision exists only for the briefest of moments for the leader before he swiftly and decisively and irrevocably marks the downbeat for the symphony of life, a magnificent but often anguished music that is played in various venues. One such venue was the European theater of World War II. 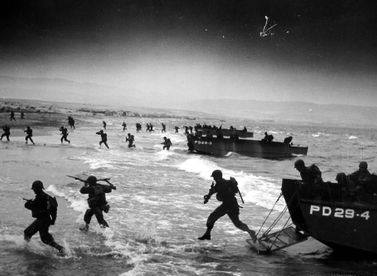 The boys on the beaches of Normandy either died or lived. Life was the irrational choice. 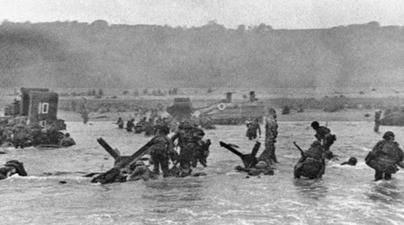 The odds were that any soldier could be shot down savagely within the space of a few agonizing leaps toward the beachhead. One by one, however, and one step at a time, the soldier who chose to lead, and instinctively chose to live, crawled forward on that sand which became the sanctified sand of eternal time. The mortal became the immortal on that day. We live in liberty on this day because of those perhaps too rare individuals who listened to the inner voice that determined they would not die with the rest on the sacred soil of France. They would have to leave their fallen comrades there, on the cold bloodied beach, beneath the restless sky where their Maker watched over all and brought many of them Home. Presumably, to the victor go the spoils and yet the only reward asked of any nation by the exceptional nation called the United States was the plot of ground called a cemetery. America buried its dead in those foreign soils and then America left those foreign soils, hopefully to lead by example. For many years, Charles de Gaulle and his lectures of wisdom, his cutting words of warning were ignored. He was not mocked or ridiculed for his strong opinions and firm beliefs. People would first have had to listen to him to jeer at him! Similarly, Winston Churchill was the voice in the wilderness. The morose de Gaulle grew agonizingly depressed; nothing was ever mediocre or middle-of-the-road for Charles. The fiery Churchill painted — in bright, beautiful, luminous colors. 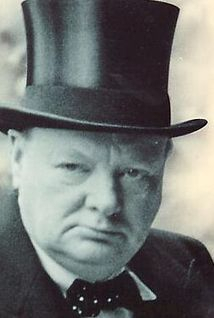 In this world of darkening clouds within the gathering storm, anyone who choses to lead can find inspiration, solace, confidence, and the certain smile of certainty in the words of Winston Churchill. In that light of truth, anyone can choose to believe in what is real, even if the future is a mystery. The following statements by Churchill are today just as real and radiant with wisdom as they were when he enunciated them. His was the heart of a lion during some heartless times.